Savory four course meal provided by chef Matt of Ganja Eats (ganjaeats.org) and CBDaily EATS (https://www.cbdailyeats.com). Tamara Anderson owner of Culinary and Cannabis as well as Sugar and Spyked loves any reason to celebrate so of course her birthday is the ultimate reason. This is year she has decided to bring both of her two world for one celebration and to help a good cause (Feeding the homeless). The celebration of life is a gift Tamara cherishes every year as with her rare medical condition Jobs Syndrome it is truly a struggle to wake up each day and to make it through 364 of days is a blessing. With the celebration of life Tamara also wants to give back to the community by accepting non-perishable food items, feminine hygiene product and $10monteray donation for those who will not be able to attend the event. 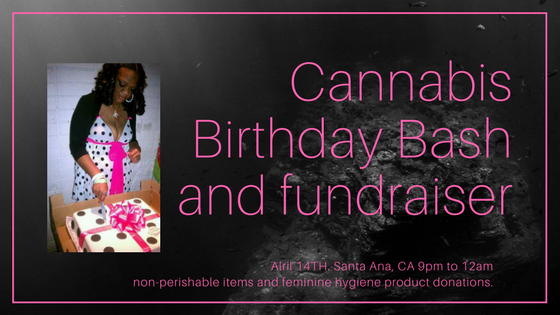 Catering provided by Chef Matt sponsored by Ganja Eats and CBDaily menu will include the/cbd infusion and non-infused menu. Dessert sponsored by Blaze_n_Janes and Chef 4u.